KOUROU, French Guiana: Malaysia’s largest satellite, Measat-3b was successfully launched here at 7.05pm (6.05am Malaysian time) yesterday. 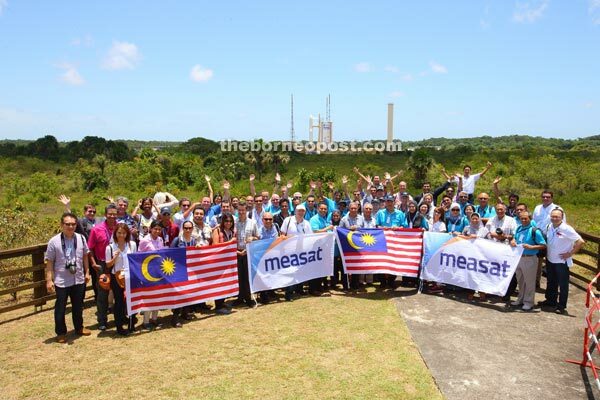 Jailani (eighth right) together with senior Malaysian government and private sector officials, key Measat business partners and Measat staff taking a group photo prior to the launch of MEASAT-3b (in the background). The satellite, to provide satellite communications across Malaysia, India, Indonesia, and Australia, lifted off on an Ariane 5 ECA launch vehicle from the European Space Port here. Deputy Minister of Communication and Multimedia Datuk Jailani Johari, who was present, described the successful launching as another milestone in developing Malaysia’s satellite system to benefit Malaysia and the wider Asia-Pacific region. “Measat Global Berhad (Measat) has played an essential role towards achieving all these goals via its satellite programme, beginning with Measat 1 and 2 in 1996. Alongside ongoing government initiatives such as the High Speed Broadband Project and Universal Service Provision Programmes, Jailani said Measat’s efforts would enable many sectors to improve service value and reduce costs, particularly in education, healthcare, and government services. Jailani said the Ministry of Communications and Multimedia and The Malaysian Communications and Multimedia Commission (MCMC) would adopt a proactive regulatory stance. Also present at the launching were Malaysian Ambassador to France, Tan Sri Ismail Omar, Astro chairman Tun Zaki Tun Azmi, Measat chairman Datuk Umar Abu, Measat Satellite Systems chief executive officer Paul Brown-Kenyon, and Measat Satellite Systems Space Systems Development senior vice president Dr Ali Ebadi. The launch was broadcast live for 400 secondary school students who were at Malaysia’s National Science Center together with government officials, business partners, and Measat staff. Over the next few days, the Measat-3b satellite will be raised from the geo-transfer orbit into a geostationary orbit at Measat’s key 91.5°E video neighbourhood. The satellite will then undergo testing for about one month before starting commercial operations. Measat-3b will co-locate with Measat-3 and Measat-3a to form one of the region’s most powerful and robust orbital locations.